Admittedly I woke up feeling sad this morning, a sort of "Pitiful Pearl" attitude, but I didn't let it hang on and ruin the day. Wanting to move forward on the sweater I'm still, yes still, knitting after the necessary chores were done I allowed myself 1 episode of "Stranger Things" and some knitting time. At least it's starting to look like a garment. Although I haven't done any today I've been all excited about making these little bits of crochet that will someday become fabric and after that a hat, purse, or vest or? I haven't crocheted much in a lot of years so right now the key word is practice, but it's a fun way to use of scraps of worsted weight yarn and a a break from the intensity of the knitting. The towels are now washed, dried and put away and there's a large casserole dish of Greek Chicken ready for whoever shows up. The eldest daughter, her husband and two pugs are currently living in their camper which is parked at Erin's house. The closing on the house they sold was two weeks in advance of the one they bought. I've been trying to have food available so they don't have to cook. Tomorrow down will come the Halloween decorations. I only put them up because my granddaughter wanted me to and she did help put them up. Oops she won't be here when I take them down, but down they must come, well except for the gourds. They could be left sitting about till Thanksgiving if they don't rot. We've had a hard freeze and now I'm hoping for some warmer weather (temps have been in the 40's) so that I can dispose of the last of the dead annuals as they look quite ugly. I'm nearly finished with the book I've been reading, "Before the Poison" by Peter Robinson. Just the thing after being dragged down in the maelstrom of V. Woolf's life and work. I do love a good British mystery especially when there's a love story involved. Nearly finished darning my favorite pair of purple sock and am finding the darning egg to be a great investment. 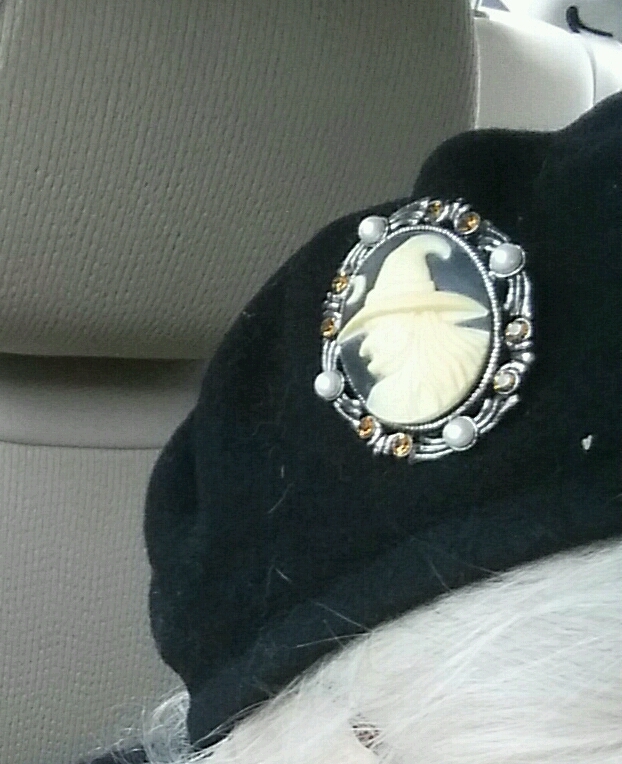 I stuck my witch pin on my hat, declaring it to be my costume for this year. Happy Halloween! Crochet goes so much faster than knitting and it's easier to rip out if you screw it up. 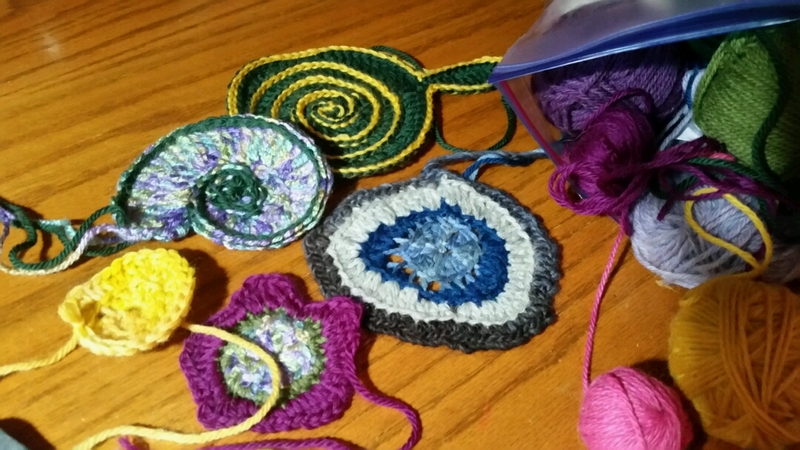 I crocheted in the 70's, there was a brief revival when granny squares came around. Why mess with a good things, everyone can use a blanket. Good on you for pushing through the storm and making the most of your day. You're my second friend who knits, and I so want in on that gig. It's the first thing I'm going to teach myself when I'm in my new place! Going to park myself in front of the fire and practice until my fingers ache. I'm off to take down my own mountain of decorations now--ugh! And it's so cold out now. Hah.. my decorations are all down and stored, but hey I only have a couple of totes full. And, I was up at 5, needed something to do. Greek chicken, yummy and easy, made with a rotisseries chicken. Kids ate it all. Today it's crock pot cheesy potato soup. Yes! I love that it's a practical skill (I like doing massive puzzles, but there's not much use for them once you're done...) I'll probably end up doing something small and relatively simple like a cat blanket or something haha but then YES to knitted knee-high socks. Love 'em. I'm a hat gal, too, because who the hell can keep up on this root business? I've tried to remedy my insomnia, but I think I'm just wired this way. I get up between 7 and 8 in the morning because the dog's gotta go out, but I only fall asleep around 3AM so I'm pretty much a zombie until that third cup of coffee kicks in. In the spring of our life together the husband and I put together lots of puzzles, glued them together and covered a whole wall with em. Still each year he and our daughter usually do a couple. Never used a crock pot till recently, though I'm home and could cook it on the stove, it seems easy just to dump it all in the pot and wait. As soon as I can get myself together will send instructions or link. Glad you like it, very easy. I tried to learn to crochet toys earlier this year and failed miserably, so I'm not sticking to two-dimensional objects to practice my basic crochet skills. I may be the only person on this planet who finds crochet more difficult than knitting, but I learned to knit as a little girl, so of course I have much more knitting practice. http://snovej.com/... I used the magic circlr for my beginning ring. I also crocheted into the back loop only and did chain stitch embroidery onto the front loops of the spiral. There are a lot of YouTube vids of how to make the magic circle. I can do the magic circle. Not sure about the embroidery.